Walk your dog during the cooler parts of the day, for example, early morning or early evening. Also, be prepared that your usual dog walking route may be too long or hot, especially if it involves walking across open areas of ground where it’s hard to escape the sun. Instead, pick a route that has plenty of cool shade from vegetation, buildings or trees (e.g. through the woods or well-covered pathways). Also, if your dog is a keen swimmer or paddler, walking near a lake, sea or pond where your pooch can safely take a dip, is a great way to cool down. Whether you are heading out for a dog walk or taking your pet on an adventure in the car, make sure you pack plenty of fresh water and a portable bowl. This hot weather can make your pooch vulnerable to dehydration, so it’s vital that they have plenty of opportunities to drink and keep themselves hydrated. Greenhouses and conservatories can transform into sun traps if in direct sunlight and quickly become dangerously hot. So, before you leave your house or close-up your greenhouse or conservatory, make sure that it’s pet-free - cats, especially, love to hide in them. To avoid any burnt paws (ouch! ), it’s worth checking the pavement temperature is not too hot, by pressing your palm on it for 15 seconds. If it’s not bearable for you, it probably won’t be for your pet either. 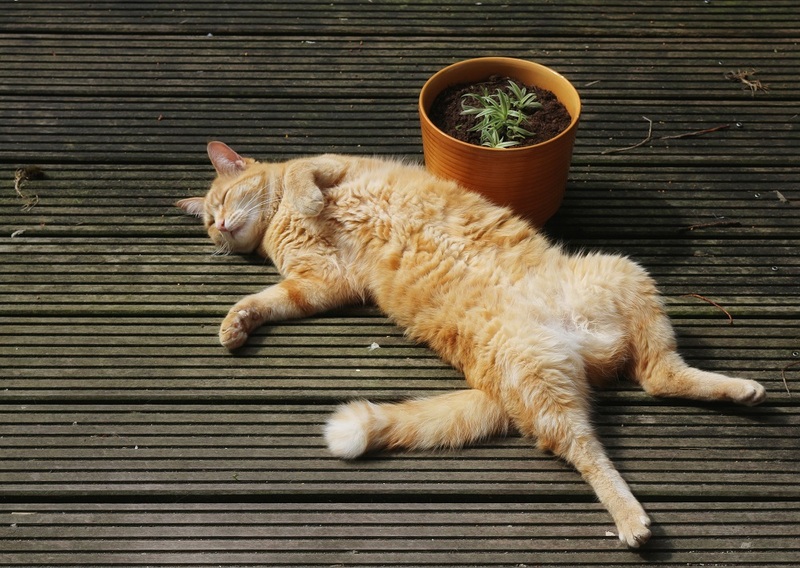 Many of our pets love nothing more than basking in the sunshine. Unfortunately, they are not always good at judging when it’s time to head for the shade and can place themselves at risk of overheating. This is particularly true of our feline friends who will happily sprawl out on the nearest flat roof in the heat of the day. So, keep a close watch on them and move them into the shade (or inside) if you are worried they are getting too hot. Even if you are parked in the shade with the windows down, the temperature in your car can rapidly rocket up to oven-worthy temperatures. Keep a close watch on your cats and dogs this summer, as unlike us, our pets are not as efficient at cooling down and rely solely on panting and sweating through their paws. This means they can quickly overheat and be vulnerable to heatstroke. Heatstroke is an emergency and can be fatal. If you are worried that your pet may have heatstroke, get them out of the heat immediately and into the shade or indoors. Cool them down by draping a cool (not cold) wet towel over their body and seek veterinary attention immediately. ©2018 Merial Animal Health Ltd. All rights reserved. Merial is now part of the Boehringer Ingelheim Group of Companies. Date of preparation: Jun 2018. PE2589.